Chocolate “Flights” in the Hot Tub? “Flights” not “Fights”! Yes, I talking about doing a chocolate sampling while soaking in your Hot Spring Spa!! (On the way into bed you’ll brush you teeth, of course). What a fabulous way to end your day-sampling the best chocolate while hot tub soaking! I got the idea for chocolate “flights” in the hot tub from my friend Robin. She told me last week that she and her husband do chocolate flights in bed every night. That is they sample various kinds of yummy chocolate (a lot of it made right here in Seattle), but then they have to get out of bed to brush their teeth which I think is not as relaxing as sampling in the hot tub. Anyway, my husband and I have been sampling chocolates in the tub and Fran’s Classic Grey & Smoked Caramels are top choice for hot tub soaking-or anytime. Lindt Dark Chocolate with Fleur de Sel is the runner-up. I’m sorry Godiva. We couldn’t finish your dark chocolate bar. Way too bitter. How to conduct a chocolate tasting? Atmosphere: By holding the tasting in the hot tub, you’ll be in a relaxed and quiet environment. You can focus all of your attention on tasting and assessing the flavors experienced in the chocolate. Temperature: Have the chocolate at room temperature for the best flavor. From 0 to 100%: Begin the tasting chocolate with the lowest percentage of cocoa. For example, start with several milk chocolate types and progress to dark chocolate. Gradually work up to higher percentage dark chocolate varieties. Do not eat any highly spiced foods before the tasting. When trying several varieties of chocolate, cleanse the palate with room temperature water, white bread or weakly brewed, lukewarm rose hip tea or green tea. Don’t try 15 varieties at once. Too many varieties will dull the palate, especially for the novice chocolate connoisseur. Keep the tasting to 5-7 varieties. 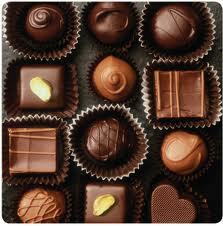 Allow approximately 1/2 ounce of each chocolate that is to be tasted per person. Take notes as you taste! In the hot tub, you’ll need a waterproof tablet from Rite in the Rain. I’m not sure what you’re using to sanitize your water, but if it’s some kind of harsh chemical such as chlorine or bromine, you may want to switch to a metallic ionizer so the odor from these chemicals doesn’t ruin your chocolate “flights”. These units completely eliminate the need for chlorine/bromine, and make for a much more enjoyable dip in general. We use SilkBalance natural water care for spas & hot tubs. No mixing, no testing, no odors. Keeps the water in perfect harmony AND gives you soft, smooth skin! Only a small amount of shock needed for sanitizing. We use a Delzone ozonator as well. I’m so glad you’re not subjecting yourself to chlorine or bromine, but some people would argue that an ozonator is just as dangerous, if not more so. Let us know if you ever decide you’d like to switch over to an ionizer, there’s nothing safer to treat your hot tub water. Have fun enjoying your hot tub, and thanks for responding to my comment! The ozonators we use have tested 100% safe. And, we do use a silver ion cartridge in our Hot Spring Spa. We use SilkBalance for balancing and preventing biofilm from forming (the material that grows bacteria). Hot tubbing is one of the greatest pleasures in life!